We have joined IMBA as a supporting organization – becoming an official voice for mountain biking and fat biking in the Eastern Sierra. Here is our “Teaming for Trails” page. We have also joined forces with the Eastern Sierra Recreation Collaborative – a broad group of recreation groups that are working together to improve recreation as a whole in the Eastern Sierra. The USFS is allowing us to label the existing brown and yellow trail signs with trail/route names. We will be using weather and fade resistant p-touch tape and coordinating volunteer days with Friends of the Inyo for implementation. This should greatly enhance the mountain biking experience for locals and visitors by alleviating confusion and increasing confidence on the signed bike routes. 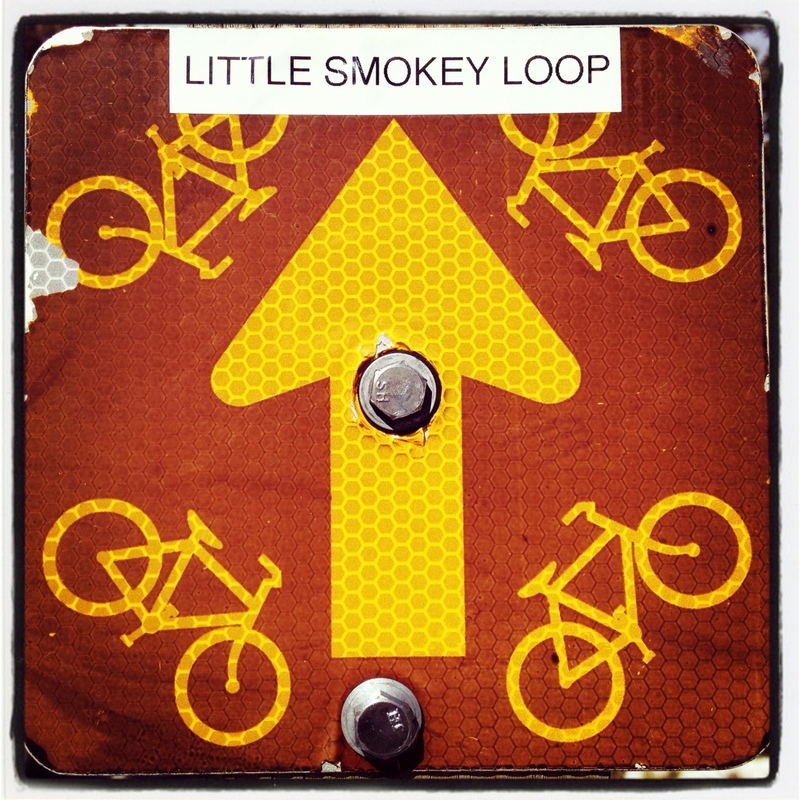 We will be starting with the Big and Little Smokey Loops once the snow clears. More info to come. Example of the trail labels on existing signage. Our meeting notes from our 2/12/14 meeting are available HERE. For National Public Lands Day, we partnered with the US Forest Service, BLM, Friends of the Inyo, and IMBA to do a trail work day at Lower Rock Creek Mountain Bike Trail. Mammoth Brewing Company supplied us with a keg of cold Paranoids Pale Ale for lunch, and we supplied a sandwich bar. Read more about the great day we had, HERE. A couple cool things going on right now. #1 – The Kamikaze Bike Games!! Fat Bike Mammoth has helped create GPS tracks for the Enduro Course (used on the KBG website and their Strava links) and we actually have procured a Fat Bike Class in the Cross Country Race. The Festival goes from Sept. 5-8, and there’s something for everybody. We recently met with reps from BLM, USFS, and Friends of the Inyo at the Lower Rock Creek Mountain Bike Trail. After helping assess trail conditions, a game plan has been established for a trail work day on Sept. 28th. We’ll be recruiting volunteers to help us fix bridges, trim vegetation, and just “spruce” up the trail in general. If you ride this local gem, you’ll want to come out and give something back!! More info to come. We are proud to be joining forces with MLTPA, Friends of the Inyo, and Footloose Sports on June 1st. We’ll be co-sponsoring a Trail Stewardship Day at the Panorama Dome Trail. As you may know, this great trail was closed last Summer and suffered a lot of damage. Please join us as we help this awesome trail gain back it’s singletrack glory! We need as many volunteers as possible to resurrect this local gem!! To get involved and find out the details, join our email list. Last night, we attended the US Forest Service Management Plan Revision Meeting. In a nutshell, the Inyo National Forest has been working from a “Management Plan” that’s been in place since 1988. It’s well overdue to be re-assessed and re-vamped. Last night’s meeting was a chance for the public to chime in and speak directly about issues to Forest Service Officials that are in a position to implement change in the new Management Plan. “Recreation” was one of the topics. In addition to speaking at the meeting, we will submit more formal comments before the April 5th deadline. These comments will be taken into consideration as the new Management Plan goes through the assessment and adoption phases. We raised awareness and educated a bunch of USFS Officials, including Ed Armenta (The Forest Supervisor for the entire Inyo National Forest). In addition, we made some new allies with the Sierra Club and Friends of the Inyo. Our goal for the meeting was to express the necessity for the new Management Plan to incorporate flexibility for emerging recreation activities like fat biking and existing recreation like mountain biking (flexibility to implement new trail building projects easier). Response was favorable. Unfortunately, the new Management Plan isn’t slated to be adopted until 2016. So, although these far-reaching goals are important, we’re still more concerned with getting fat biking legalized on groomed trails way before 2016!! So our main objective right now is still to get the old Forest Order amended to allow fat bikes on groomed trails. Small, incremental steps lead to success. We spoke at length today with IMBA’s Michael Kelly. IMBA is standing behind our movement to allow fat bikes access to groomed snowmobile trails in the Inyo National Forest. This is great news. In addition, we are entertaining the idea of making Fat Bike Mammoth an official IMBA club here in Mammoth. With an IMBA partnership we’ll have much more weight when advocating for all forms of mountain-biking and off-road cycling year round (mountain biking, fat biking, bikepacking, adventure touring, etc). This could also help with funding for trail maintenance and new trail creation. It’s about time. The goal is for Fat Bike Mammoth to become a year round “all-terrain adventure” bike club. The important note here is they agreed that “The Forest” should be responsible for carrying out the analysis. Initially, our local USFS reps have told us that we should do the analysis. So hopefully, if we can get the USFS to start the analysis ASAP, it’ll have more impact since they worry of objectivity will be nullified. Tom Ward, the IMBA (International Mountain Biking Association) California Policy Advisor emailed us today to let us know he’ll be meeting with US Forest Service Region 5 (our region) Trail Managers on Feb. 28th. He will bring up the subject of fat bikes at the meeting. Looking forward to hearing back about it. We made a Fat Bike Awareness/ Education presentation at the Mammoth Lakes Trails Meeting on 2/14/13. Present at the meeting were Mayor of Mammoth Lakes, Matthew Lehman, and Recreation Committee Chairman, Bill Sauser. Also present was John Wentworth, president of MLTPA (Mammoth Lakes Trails and Public Access), and as well as representatives from Friends of the Inyo, The Sierra Club, and many others. It was a great chance to discuss fat bikes, and why we’re advocating to share the multi-use groomed snowmobile trails. We were able to explain how the bikes float over snow, with minimal impact. We also discussed interaction on trail between multiple user groups, and brain-stormed how to do trail impact and safety analysis to present to the Forest Service. Everybody seemed stoked on the bikes, and open to the possibility of sharing the Winter trails with them. Thanks to all the fat bike advocates that came to support!! Working with IMBA (International Mountain Biking Association) to create a Trail Impact, Safety, and User Interaction analysis format. Scheduling “Demo Day” for anybody and everybody to try riding fat bikes, and learn about them. Education, awareness, and respect for fat bikes is the main our goal of a Demo Day. Kathy Copeland, President of Disabled Sports Eastern Sierra is officially endorsing Fat Biking on the shared public groomed trail system in the Inyo National Forest. Thanks, Kathy!! Recreation for all!! We’ve been emailing back and forth with Jon Kazmierski, Mammoth Lakes Recreation Officer for the US Forest Service serving the Inyo National Forest. He’s aware of fat bikes, and our intention to share the groomed trail system. His initial comments are positive, but there are a lot of technical and bureaucratic hoops to jump through. Included in our email conversation is Scott Fitzgerald in Victor, Idaho. Scott is a pioneer in Fat Bike Advocacy, and recently helped organize the Fat Bike Summit where land managers from across the country went to Idaho to educate themselves about the new bikes. Jon gave suggestions for the next steps: 1. Create a format for analyzing trail impact, safety, and multi-use interaction. 2. Once this format is approved by him, we get a non-biased group (US Forest Service, State Parks, Nordic Skiers, Snowmobilers, etc) to participate in the analysis. In the mean time, we’re trying to raise awareness, and open minds to fat biking and the possibilities of another outdoor recreation opportunity. Fat Bike Discussion is officially on the agenda of the Mammoth Trails Meeting on 2/14/13 at 3:30pm in the Library. Please attend, it will be very informative. We spoke today in front of the Town of Mammoth Lakes Recreation Committee. It was our first chance to introduce fat bikes to the town, and explain our goal of sharing the groomed trail system with snowmobiles, nordic skiers, snowshoers, and hikers. Most at the meeting had never heard of or seen these bicycles. Got some positive feedback and met John Wentworth of the MLTPA- who’s a proponent of fat bikes. George Shirk of The Mammoth Times was also on hand, and decided to write an article (READ THE ARTICLE HERE). to spread awareness. Bill Sauser, Committee Chairman, recommended that we attend next week’s Mammoth Trails Meeting as well.